The incredible sighting was caught on tape. Spix's macaws (from left to right) Felicitas, Frieda, Paula and Paul sit on a branch in their aviary at the association for the protection of endangered parrots in Schoeneiche, eastern Germany, on October 11, 2011. It’s a bolt from the blue. A Spix's macaw, a critically endangered blue parrot that's thought to be extinct in the wild, has been spotted for the first time since 2000 flying near the town of Curaçá, Brazil. The sighting was caught on video by 16-year-old Damilys Oliveira who used her phone to capture the rare moment. Due to the bird’s distinctive vocal calls, wildlife experts have confirmed that the blue-feathered beauty in question is indeed a Spix's macaw. The species, which is said to have been the inspiration behind the movie "Rio," is a source of pride in the Curaçá region and its reappearance is taking hope to new heights. In fact, when the Oliveiras contacted the Society for the Conservation of Birds in Brazil (SAVE Brazil) about the discovery and the group’s CEO, Pedro Develey, traveled to Curaçá to search for the parrot, he immediately noticed that locals were euphoric. "You should have seen the joy of the people when I got there, saying the macaw was back," Develey told The BBC. Spix's macaw Bonita is pictured on April 17, 2014 at the ACTP wildlife conservation organization in Schoeneiche, eastern Germany. According to BirdLife International, a conservation group that assessed the status of the bird, the Spix’s macaw was thought to be extinct in the wild due to pet trade trapping and loss of habitat due to African bees that take over nest cavities. But the birds may not have been that common to begin with. Since Johann Baptist von Spix, a German biologist spotted the bird in 1819, sightings have been few and far between. In 1986, researchers found three birds, thought to be the last three Spix's macaws in the wild, but they were soon captured, and no one has seen one in the wild since 2000. Spix's macaw couple Bonita and Ferdinand are pictured on April 17, 2014 at the ACTP wildlife conservation organization in Schoeneiche, eastern Germany. Which leads to another factor, being that this species of bird can live for to 20 to 30 years in the wild is the parrot in the video the one last seen in 2000 or a bird released from captivity? "We don't know – and that makes it even more interesting," Develey told NPR. Locals in Curaçá, as well as an official expedition supported by the government, are looking for the bird and finding the parrot is imperative. 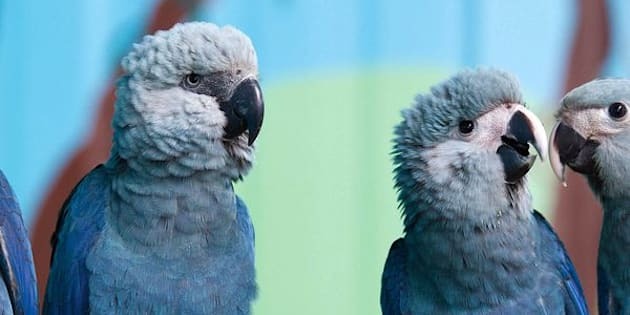 About 130 Spix’s macaws have been bred in captivity in Germany, Brazil and Qatar with the hopes of releasing some into the wild, and this mysterious parrot could help. Two Spix's macaw chicken called Karla (left) and Tiago are pictured on April 17, 2014 at the ACTP wildlife conservation organization in Schoeneiche, eastern Germany. "The real value of this bird is that it's in the wild," Develey told NPR. "What we need now is a wild bird … to start to understand what to do when we release the new birds. Now we have a model to understand the bird's behavior."